This review assumes a basic understanding of the appropriate technology. Reviewed Sept 2005. We've updated this Garmin etrex Legend review with our latest findings in following years. After some careful Internet research we choose the Garmin etrex Legend GPS personal navigator as being suitable for our needs, some further web research for an online supplier and our Sat Nav arrived the next day - at 7.30 AM! GPS uses a number of orbiting satellites, the signals from which are picked up by the GPS Sat Nav receiver which can then compute your position. This Sat Nav unit is designed for portable navigation (eg. for walkers like us!) and resembles a mobile phone with a large screen. It comes with a pre-loaded zoomable Basemap showing main roads, railways, towns and cities. Locations can be added (waypoints), either for the current location or for a projected location, which can then be named and symbolised. Routes can then be set between waypoints. When moving, it draws a breadcrumb trail on the map and computes information such as current, average and max speed, distance travelled, stopped and moving time. The TracBack feature allows you to retrace your path along this trail. Using the GoTo function to navigate to a pre-determined location, such as a waypoint, the unit can display the time and distance remaining until arrival and the ETA. A compass can be viewed to navigate, this also shows the number of degrees needed to turn to get back on track. The User Interface (UI) works much like Windows does on a PC, with a number of pages and a clickable joystick that functions like a mouse. Routes and trails can be named and stored in its built-in 8Mb memory. Street level maps can be purchased and loaded from CD (via a computer). There's more to all this, but that's the basics! Above right. Mike holds the GPS Sat Nav receiver in his hand with the map page displaying our trail from our waypoint marked cottage (by the little pan arrow) and running south of Dorchester. We only had a day or so to learn about our GPS receiver and how to work it before our holiday, however it was all fairly straightforward. We first tried the Sat Nav on the car journey from home to the holiday cottage and set the cottage location as a waypoint on the Basemap, by inputting the National Grid Reference (NGR) which in turn we obtained by inputting the Post Code into multimap.com. Of course, we'd already marked our home location waypoint during our learning, so all we needed to do was create a route between the two and off we went! Despite the warnings implying that it wouldn't pick up the satellite signals through the windscreen (our windscreen is UltraViolet filtered and has a QuickClear element, apparently both bad news at getting a signal) it worked perfectly lying on the dash. Now Belinda's paper map navigational skills are second to none of course, so we referred to the Sat Nav as confirmation we were headed in the right direction and to view the miles remaining and our ETA. We arrived at the cottage with the Sat Nav unit saying we had another quarter mile and some 20 seconds to go, this can no doubt be put down to the very rural location having a very wide Post Code area! If you've looked at our Dorset holiday pages, you'll see we enjoyed a steam train ride on The Swanage Railway. Using the Sat Nav to monitor our train progress, it was interesting to notice that the train just about managed to reach a maximum speed of 30.4 MPH! We had to balance the unit against the window to receive enough oomph from the satellite signals, but despite it only being able to 'see' half the sky, it received enough satellites to work. The satellites couldn't help with more oomph for the train unfortunately! We later tried the unit on a modern train (to Brighton) and it registered a max of 88.2 MPH. Much more oomph! We used the Sat Nav unit on our Hardy's Monument walk to see if it could get us back to the cottage by using the TracBack feature. This works by saving the breadcrumb trail we left on the outward journey and selecting 'TracBack' from the saved track menu. The time and miles to destination are shown by default on the navigation page with a compass, we customised the display to additionally show the ETA and To Course on the display, the latter shows how many degrees to turn to maintain the correct direction. It worked brilliantly, we purposely walked past a point where we should have turned right and the Sat Nav unit compass arrow swung round to show the correct direction in an instant. The ETA was within 1 minute too, not bad when the trip computer has to work this out by constantly updating our speed computation, including stops for a swig of water and a pee (Mike)! However, we found a problem using GPS on our walk along the South West Coast Path at Lyme Regis. As the walk was mainly in dense woodland, the Sat Nav unit had trouble picking up the satellites signal. It needs to receive at least three to work, the trees blocking its view of the sky and the resultant trail was very patchy. We didn't try the TracBack, but we expect it would have had trouble following such a broken trail. On our Fleet walk, also along the S. W. Coast Path, the trail was complete as the footpath was well out in the open. That was good for the Sat Nav unit, but not for us in the hot hot sun! This was a circle route and the GPS really came into its own when, having been forced along some twiddly bits, we came out to a little road and our sense of direction said to turn right. The GPS showed the start of our trail (where we had parked the car) to be to the left, thus saving us from going completely in the wrong direction! An issue that manifested itself on our walks was with having to hold the Sat Nav unit in your hand all the time in order to receive a signal. This became a bit tiresome and sometimes awkward when needing both hands to cross a style, for instance. We tried carrying it in a bumbag and at the top of Mike's (why do I always carry all the stuff) backpack, but in both cases the GPS signal was too poor, even in open country. Oh dear! We experienced the same problem with patchy satellite reception as in woodland. In both Lyme Regis and Dorchester the buildings weren't particularly tall, but they were still sufficient to block some of the sky and hence GPS signal. Worse still, it became apparent that our positioning on the Basemap was way off. At Dorchester train station our position was shown some 0.3 miles too far to the north. We should make it clear that our location ie. grid ref, or Latitude and Longitude was always spot-on, it was where it drew us on the map that was way out. Some subsequent tests we did in Brighton showed us to be just north of the main A259 coast road when we were out at sea at the end of the quarter mile long pier! This inaccuracy rather makes it superfluous of GPS being capable of an accuracy to, typically, 12 meters and certainly doesn't enthuse us to buy the MapSource CDs to give street level mapping. Would it ever show us in the right street? Come to that, would it receive enough satellite signal in town anyway?? We've added this bit as we experienced problems in this area too. The Sat Nav receiver takes two 'AA' sized batteries, either dry or rechargeable cells. We used modern Nickel Metal Hydride (NiMH), convenient for us as our digital camera and MP3 player use the same cells. We found that fully charged batteries barely lasted the day out using the Sat Nav unit from, typically, 10am until 6pm. There's a battery saver mode which did extend battery life, but the trade off was less frequent satellite signal checking, resulting in even more patchy trail drawing. We tried setting the backlight to the minimum too, to conserve power. However, we needed to carry spare cells (fortunately a battery change doesn't loose data as it's stored on internal flash memory) to ensure continued operation all day. Keeping enough batteries charged for a day's walking became a logistical challenge with only one charger able to charge a pair of NiMH's for 8 hours at any one time. Some nights Mike (why me!) was changing batteries in the middle of the night to provide enough for the next day (yawn!). Of course, the easy solution is to buy another charger, they're cheap enough after all, but surely if mobile phones can easily last in excess of one day on a charge then so should a little GPS Sat Nav unit. The Sat Nav receiver also has a calculator, area calculator (eg. walk round a field and calculate the acres), distance calculator, hunt and fish calculator, calendar with notes, sun/moon set/rise times (can be projected for different locations and days), a favourites store and a find feature, eg. find a town which it then describes. The Garmin etrex Legend GPS Sat Nav unit we used does have some very useful features for walkers, such as its ability to get you back to your starting point or to guide you to a pre-determined point. It also provides reassurance that you're going in the right direction when otherwise you'd have no idea. We do have some serious concerns regarding its ability to correctly show the position on the Basemap, plus its ability to receive a consistent satellite signal in wooded and built-up areas. Not all walking is done along open paths! We suspect the same situation here as experienced with cell phone technology in the late 1980s. The system was initially designed for vehicle use, using an external aerial. Cell coverage would drop out with early handheld portable phones. The situation will surely improve with satellite strength and coverage, making handheld GPS a better proposition in say, a few years time. There's also the new Galileo navigation system in development, see links below. An early adopter of technology is often disappointed. For now, by all means purchase a handheld GPS Sat Nav receiver, but beware of its limitations and be sure to take an old fashioned paper map with you too! Left. The trip computer page showing trip and total miles, moving and stopped time and max and average speeds. The 'speed' field on the left only registers when moving. 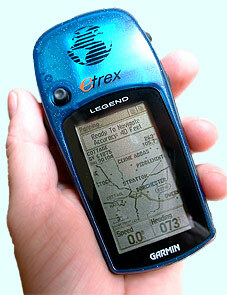 Check out our Garmin etrex Legend review updates in following years. You may also like to see how we use Sat Nav for Geocaching. Other brands of Sat Nav include TomTom and Magellan. Also check GPS software and apps for mobile devices. GPS: The New Navigation - explains how GPS works via an online game or computer app. Ordnance Survey - Britain's mapping agency. GPS Receiver Information - reviews and information on GPS receivers. GPS training - UK training courses in global positioning systems. Geocaching - all about the worldwide treasure hunting GPS hobby. Galileo - new European navigation system in development which uses 30 satellites to drastically improve signal availability and positional accuracy. What is Galileo - BBC's Q&A on Europe's Galileo project (and further links). © micbinks 2005. Please ask permission if you wish to reproduce any of our content.